Humans possess exceptional drive and a great capacity to endure and expand, and as such are currently the dominant race in the world. Their empires and nations are vast, sprawling things, and the citizens of these societies carve names for themselves with the strength of their sword arms and the power of their spells. Humanity is best characterized by its tumultuousness and diversity, and human cultures run the gamut from savage but honorable tribes to decadent, devil-worshiping noble families in the most cosmopolitan cities. Humans’ curiosity and ambition often triumph over their predilection for a sedentary lifestyle, and many leave their homes to explore the innumerable forgotten corners of the world or lead mighty armies to conquer their neighbors, simply because they can. Human society is a strange amalgam of nostalgia and futurism, being enamored of past glories and wistfully remembered “golden ages,” yet at the same time quick to discard tradition and history and strike off into new ventures. Relics of the past are kept as prized antiques and museum pieces, as humans love to collect things—not only inanimate relics but also living creatures—to display for their amusement or to serve by their side. Other races suggest this behavior is due to a deep-rooted urge to dominate and assert power in the human psyche, an urge to take, till, or tame the wild things and places of the world. Those with a more charitable view believe humans are simply collectors of experiences, and the things they take and keep, whether living, dead, or never alive, are just tokens to remind themselves of the places they have gone, the things they have seen, and the deeds they have accomplished. Their present and future value is just a bonus; their real value is as an ongoing reminder of the inevitable progress of humanity. Humans in many places are fascinated by older races and cultures, though at times they grow frustrated or even contemptuous of ancient and (to their mind) outmoded traditions. Their attitudes toward other races are thus a curious mix of exoticism and even fetishism, though usually with a very superficial level of understanding and appreciation of those cultures, alongside a deeply rooted arrogance that means most humans have a hard time regarding themselves as anything other than the default standard of society. Human scholars engaged in the study of other races—who might be assumed to be the most cosmopolitan and well versed in their nature and culture—have often proved no better than the less-learned members of their race when it comes to genuine closing of the social distance. Humans are gregarious, often friendly, and willing to mix and interact with others, but their sheer obliviousness to their off handed marginalization of others is what so chagrins other races when dealing with them. Of course, well-meaning, blundering ignorance and numerical superiority are not the only things that make other races suspicious of humans. Entirely too many examples can be found throughout history wherein human xenophobia and intolerance has led to social isolationism, civil oppression, bloody purges, inquisitions, mob violence, and open war. Humans are not the only race to hate what is different among them, but they seem to have a susceptibility to fear-mongering and suspicion, whether about race, language, religion, class, gender, or another difference. More moderate human citizens often sit idly by while their more extreme compatriots dominate the political and cultural conversation, yet there are also many who stand in opposition to extremists and embody a spirit of unity across the bounds of difference, transcending barriers and forming alliances and relationships both large and small across every color, creed, country, or species. The physical characteristics of humans are as varied as the world’s climes. From the dark-skinned tribesmen of the southern continents to the pale and barbaric raiders of the northern lands, humans possess a wide variety of skin colors, body types, and facial features. Generally speaking, humans’ skin color assumes a darker hue the closer to the equator they live. At the same time, bone structure, hair color and texture, eye color, and a host of facial and bodily phenotypic characteristics vary immensely from one locale to another. Cheekbones may be high or broad, noses aquiline or flat, and lips full or thin; eyes range wildly in hue, some deep set in their sockets, and others with full epicanthic folds. Appearance is hardly random, of course, and familial, tribal, or national commonalities often allow the knowledgeable to identify a human’s place of origin on sight, or at least to hazard a good guess. Humans’ origins are also indicated through their traditional styles of bodily decoration, not only in the clothing or jewelry worn, but also in elaborate hairstyles, piercing, tattooing, and even scarification. Human society comprises a multitude of governments, attitudes, and lifestyles. Though the oldest human cultures trace their histories thousands of years into the past, when compared to the societies of other races like elves and dwarves, human society seems to be in a state of constant flux as empires fragment and new kingdoms subsume the old. In general, humans are known for their flexibility, ingenuity, and ambition. Other races sometimes envy humans their seemingly limitless adaptability, not so much biologically speaking but in their willingness to step beyond the known and press on to whatever might await them. While many or even most humans as individuals are content to stay within their comfortable routine, there is a dauntless spirit of discovery endemic to humans as a species that drives them in striving toward possibilities beyond every horizon. Humans are fecund, and their drive and numbers often spur them into contact with other races during bouts of territorial expansion and colonization. In many cases, this tendency leads to violence and war, yet humans are also swift to forgive and forge alliances with races who do not try to match or exceed them in violence. Proud, sometimes to the point of arrogance, humans might look upon dwarves as miserly drunkards, elves as flighty fops, halflings as craven thieves, gnomes as twisted maniacs, and half-elves and half-orcs as embarrassments—but the race’s diversity among its own members also makes many humans quite adept at accepting others for what they are. Humans may become so absorbed in their own affairs that they remain ignorant of the language and culture of others, and some take this ignorance to a hateful extreme of intolerance, oppression, and rarely even extermination of others they perceive as dangerous, strange, or “impure.” Thankfully, while such incidents and movements may taint all of humanity in the eyes of some, they are more often the exception than the rule. Humanity is perhaps the most diverse of all the common races, with a capacity for both great evil and boundless good. Some humans assemble into vast barbaric hordes, while others build sprawling cities that cover miles. Taken as a whole, most humans are neutral, yet they generally tend to congregate in nations and civilizations with specific alignments. Humans also have the widest range of gods and religions, lacking other races’ ties to tradition and eager to turn to anyone offering them glory or protection. Ambition alone drives countless humans, and for many, adventuring serves as a means to an end, whether it be wealth, acclaim, social status, or arcane knowledge. A few pursue adventuring careers simply for the thrill of danger. 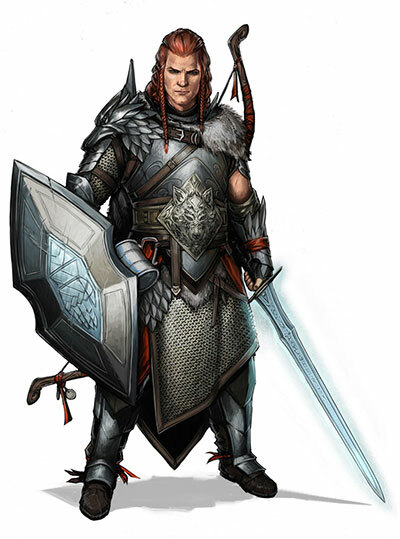 Humans hail from myriad regions and backgrounds, and as such can fill any role within an adventuring party. Female Names: Alerdene, Alinza, Aula, Bach Hien, Belka, Beshkee, Chammady, Chao, Do Quyen, Eshe, Eudomia, Gerda, Hiriko, Ilinica, Indah, Ingirt, Izora, Jalket, Jayazi, Kaede, Kalizama, Kamshi, Lestari, Leyli, Marisan, Me’amesa, Meilin, Mirelinda, Mpaandi, Nalmida, Nanya, Narantuyaa, Ntisi, Pasara, Pontia, Que Xuan, Revhi, Runa, Sahba, Shirin, Shivkah, Sinkitah, Surenchinua, Udara, Umie, Valki, Waajida, Xemne, Xue, Zalika, Zova. Male Names: Aakif, Andrezi, Arasmes, Bahram, Baolo, Barid, Batsaikhan, Belor, Budi, Darvan, Dolok, Eilif, Garidan, Gellius, Hadzi, Hamengku, Harisko, Iacobus, Jaali, Jianguo, Kjell, Kousei, Kronug, Menas, Mitabu, Narsius, Nonek, Pateba, Pratavh, Qorchi, Ragnar, Rubani, Seckor, Shokamb, Shuo, Sunaki, Suryo, Tabansi, Teruawa, Thanh Liem, Toan Hao, Tomorbataar, Tuong Kinh, Ursion, Vachedi, Viorec, Yekskya, Zaiho, Zhen. Languages: You can speak, read, and write Common and one extra language of your choice. Humans typically learn the languages of other peoples they deal with, including obscure dialects. They are fond of sprinkling their speech with words borrowed from other tongues: Orc curses, Elvish musical expressions, Dwarvish military phrases, and so on. These traits replace the human’s Ability Score Increase trait.